Greetings from Atlanta, GA!! I’m here playing with Jump Babylon at the Atlanta Jewish Music Festival! We played a school show this morning, and tonight we are playing the festival opening night concert at a very cool venue called Steve’s Live Music. It’s a little tough to keep up with work for my ongoing Indiegogo campaign while I’m on the road, so I’m happy I managed to get a few hours to work on this post. I met Dominic Gobeil at McGill, we did our Master’s degrees at the same time. I had just moved to Montreal from Vancouver, and Dom had just moved from Quebec City. About a month into school, I got a gig from the booking office for a trio with sax, guitar and bass. I didn’t really know anyone outside the program yet, so of course I asked Dom to play the gig, along with Patrick Lampron on tenor sax (whose website seems to be out-of-date: here’s his CD Baby page instead). At the time my French was very rusty and Dom’s English was very weak, so conversations were a challenge, but we made it work. Ever since then, we played together quite a lot, collaborating on many projects. Dom played on my first album, the Joel Kerr Quintet, along with Jared Greeve on trumpet, Patrick Lampron on tenor sax, and Eric Thibodeau on drums. I played on Dom’s first album, DG4, which was the same band minus Jared (and is part of my Joel Kerr Complete Works Indiegogo perk!). And we both played on Patrick’s album. A large number of our class at McGill got together and formed a composers ensemble, called the M-Theory Collective. The band went through a few members, but in addition to Dom and me, it included Mireille Boily on vocals (who is also singing on my upcoming album! ), Jared and Bryson Barnes on trumpet, Jason Stillman on alto sax, Patrick on tenor, Alex Côté and then Philippe Côté on bari sax (no relation – that I know of), Etienne Lebel on trombone, Marie-Claire Durand on piano, and Kevin Warren and then Dan Garmon on drums. It was a great group, very creative. I miss that band – it’s still a dream project for me to somehow record all the stuff I wrote for that ensemble. In the summer of 2012, Dom, Patrick, Eric and I, along with Craig Pedersen, put together a week-long tour of Quebec and Ontario, culminating in a magical performance along the St-Lawrence River in Les Escoumins. There is a festival called On Jazz sous le lune, the concerts are in the Saguenay-St-Lawrence Marine Park, and the stage is right on the river – so while we played, the moon was setting over the river, and beluga whales were swimming around behind us. We recorded ourselves live the next day back in Montreal with Paul Johnston engineering, and the result is the album Live in Silence (which is part of the Joel Kerr Discography Indiegogo perk). As you might imagine, when you work on composition and original material for this amount of time with someone, you can’t help but be influenced by them in some way. Dom and I both are influenced a lot by classical music and various modern compositional techniques, and knowing how much output he had was always good motivation for me to compose more. 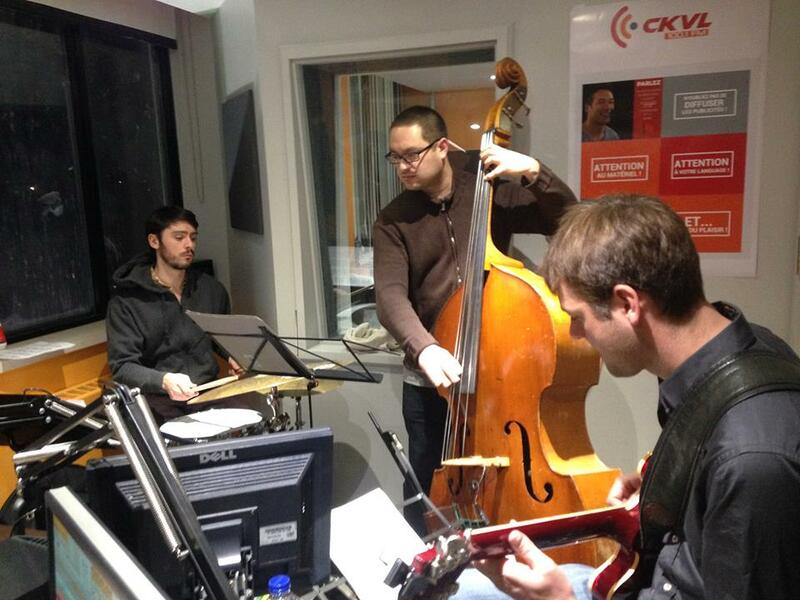 After a long stretch of not playing together, I played with Dom and Eric on Coco Jazz (CKVL 100.1 FM in Montreal), and it felt great – hopefully it will happen more!